Not to be confused with Acetoin. Acetone is miscible with water and serves as an important solvent in its own right, typically for cleaning purposes in laboratories. About 6.7 million tonnes were produced worldwide in 2010, mainly for use as a solvent and production of methyl methacrylate and bisphenol A. It is a common building block in organic chemistry. Familiar household uses of acetone are as the active ingredient in nail polish remover and as paint thinner. It has VOC exempt status in the USA. Acetone is produced and disposed of in the human body through normal metabolic processes. It is normally present in blood and urine. People with diabetes produce it in larger amounts. Reproductive toxicity tests show that it has low potential to cause reproductive problems. Ketogenic diets that increase ketones (acetone, β-hydroxybutyric acid and acetoacetic acid) in the blood are used to counter epileptic attacks in infants and children who suffer from recalcitrant refractory epilepsy. Acetone was first produced by alchemists during the late Middle Ages via the dry distillation of metal acetates (e.g., lead acetate, which produced "spirit of Saturn" (since the alchemical symbol for lead was also the astrological symbol for the planet Saturn)). In 1832, French chemist Jean-Baptiste Dumas and German chemist Justus von Liebig determined the empirical formula for acetone. In 1833, the French chemist Antoine Bussy named acetone by adding the suffix -one to the stem of the corresponding acid (viz, acetic acid). By 1852, English chemist Alexander William Williamson realized that acetone was methyl acetyl; the following year, the French chemist Charles Frédéric Gerhardt concurred. In 1865, the German chemist August Kekulé published the modern structural formula for acetone. Johann Josef Loschmidt had presented the structure of acetone in 1861, but his privately published booklet received little attention. During World War I, Chaim Weizmann developed the process for industrial production of acetone (Weizmann Process). Small amounts of acetone are produced in the body by the decarboxylation of ketone bodies. Certain dietary patterns, including prolonged fasting and high-fat low-carbohydrate dieting, can produce ketosis, in which acetone is formed in body tissue. Certain health conditions, such as alcoholism and diabetes, can produce ketoacidosis, uncontrollable ketosis that leads to a sharp, and potentially fatal, increase in the acidity of the blood. Since it is a byproduct of fermentation, acetone is a byproduct of the distillery industry. Although some biochemistry textbooks and current research publications indicate that acetone cannot be metabolized, there is evidence to the contrary, some dating back thirty years. Acetone can be produced from the oxidation of ingested isopropanol, or from the spontaneous/enzymatic breakdown of acetoacetate (a ketone body) in ketotic individuals. It can then be metabolized either by CYP2E1 via methylglyoxal to D-lactate and pyruvate, and ultimately glucose/energy, or by a different pathway via propylene glycol to pyruvate, lactate, acetate (usable for energy) and propionaldehyde. In 2010, the worldwide production capacity for acetone was estimated at 6.7 million tonnes per year. With 1.56 million tonnes per year, the United States had the highest production capacity, followed by Taiwan and mainland China. The largest producer of acetone is INEOS Phenol, owning 17% of the world's capacity, with also significant capacity (7–8%) by Mitsui, Sunoco and Shell in 2010. INEOS Phenol also owns the world's largest production site (420,000 tonnes/annum) in Beveren (Belgium). Spot price of acetone in summer 2011 was 1100–1250 USD/tonne in the United States. Other processes involve the direct oxidation of propylene (Wacker-Hoechst process), or the hydration of propylene to give 2-propanol, which is oxidized to acetone. Previously, acetone was produced by the dry distillation of acetates, for example calcium acetate in ketonic decarboxylation. 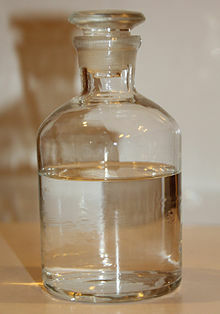 After that time, during World War I, acetone was produced using acetone-butanol-ethanol fermentation with Clostridium acetobutylicum bacteria, which was developed by Chaim Weizmann (later the first president of Israel) in order to help the British war effort, in the preparation of Cordite. This acetone-butanol-ethanol fermentation was eventually abandoned when newer methods with better yields were found. About a third of the world's acetone is used as a solvent, and a quarter is consumed as acetone cyanohydrin, a precursor to methyl methacrylate. Acetone is a good solvent for many plastics and some synthetic fibers. It is used for thinning polyester resin, cleaning tools used with it, and dissolving two-part epoxies and superglue before they harden. It is used as one of the volatile components of some paints and varnishes. As a heavy-duty degreaser, it is useful in the preparation of metal prior to painting. It is also useful for high reliability soldering applications to remove rosin flux after soldering is complete; this helps to prevent the rusty bolt effect. Acetone is used as a solvent by the pharmaceutical industry and as a denaturant in denatured alcohol. Acetone is also present as an excipient in some pharmaceutical drugs. Although itself flammable, acetone is used extensively as a solvent for the safe transportation and storage of acetylene, which cannot be safely pressurized as a pure compound. Vessels containing a porous material are first filled with acetone followed by acetylene, which dissolves into the acetone. One liter of acetone can dissolve around 250 liters of acetylene at a pressure of 10 bar. Many millions of kilograms of acetone are consumed in the production of the solvents methyl isobutyl alcohol and methyl isobutyl ketone. These products arise via an initial aldol condensation to give diacetone alcohol. Condensation with acetylene gives 2-methylbut-3-yn-2-ol, precursor to synthetic terpenes and terpenoids. In the laboratory, acetone is used as a polar, aprotic solvent in a variety of organic reactions, such as SN2 reactions. The use of acetone solvent is critical for the Jones oxidation. It does not form an azeotrope with water (see azeotrope (data)). It is a common solvent for rinsing laboratory glassware because of its low cost and volatility. Despite its common use as a supposed drying agent, it is not effective except by bulk displacement and dilution. Acetone can be cooled with dry ice to −78 °C without freezing; acetone/dry ice baths are commonly used to conduct reactions at low temperatures. Acetone is fluorescent under ultraviolet light, and its vapor can be used as a fluorescent tracer in fluid flow experiments. Acetone is used to precipitate proteins. Alternatives for protein precipitation is trichloroacetic acid and ethanol. Acetone is used in a variety of general medical and cosmetic applications and is also listed as a component in food additives and food packaging and also in nail polish remover. Dermatologists use acetone with alcohol for acne treatments to peel dry skin. Acetone is commonly used in chemical peeling. Common agents used today for chemical peels are salicylic acid, glycolic acid, 30% salicylic acid in ethanol, and trichloroacetic acid (TCA). Prior to chemexfoliation, the skin is cleaned and excess fat removed in a process called defatting. Acetone, Septisol, or a combination of these agents is commonly used in this process. Acetone is often the primary component in cleaning agents such as nail polish remover. Acetone is a component of superglue remover and easily removes residues from glass and porcelain. Make-up artists use acetone to remove skin adhesive from the netting of wigs and mustaches by immersing the item in an acetone bath, then removing the softened glue residue with a stiff brush. Acetone is often used for vapor polishing of printing artifacts on 3D-printed models printed with ABS plastic. The technique, called acetone vapor bath smoothing, involves placing the printed part in a sealed chamber containing a small amount of acetone, and heating to around 80 degrees Celsius for 10 minutes. This creates a vapor of acetone in the container. The acetone condenses evenly all over the part, causing the surface to soften and liquefy. Surface tension then smooths the semi-liquid plastic. When the part is removed from the chamber, the acetone component evaporates leaving a glassy-smooth part free of striation, patterning, and visible layer edges, common features in untreated 3D printed parts. Low-grade acetone is also commonly used in academic laboratory settings as a glassware rinsing agent for removing residue and solids before a final wash. The most hazardous property of acetone is its extreme flammability. At temperatures greater than acetone's flash point of −20 °C (−4 °F), air mixtures of between 2.5% and 12.8% acetone, by volume, may explode or cause a flash fire. Vapors can flow along surfaces to distant ignition sources and flash back. Static discharge may also ignite acetone vapors, though acetone has a very high ignition initiation energy point and therefore accidental ignition is rare. Even pouring or spraying acetone over red-glowing coal will not ignite it, due to the high concentration of vapour and the cooling effect of evaporation of the liquid. It auto-ignites at 465 °C (869 °F). Auto-ignition temperature is also dependent upon the exposure time, thus at some tests it is quoted as 525 °C. Also, industrial acetone is likely to contain a small amount of water which also inhibits ignition. When oxidized, acetone forms acetone peroxide as a byproduct, which is a highly unstable, primary high explosive compound. It may be formed accidentally, e.g. when waste hydrogen peroxide is poured into waste solvent containing acetone. Due to its instability, it is rarely used, despite its simple chemical synthesis. Acetone has been studied extensively and is generally recognized to have low acute and chronic toxicity if ingested and/or inhaled. Acetone is not currently regarded as a carcinogen, a mutagenic chemical nor a concern for chronic neurotoxicity effects. Acetone can be found as an ingredient in a variety of consumer products ranging from cosmetics to processed and unprocessed foods. Acetone has been rated as a generally recognized as safe (GRAS) substance when present in beverages, baked foods, desserts, and preserves at concentrations ranging from 5 to 8 mg/L. Acetone has been shown to have anticonvulsant effects in animal models of epilepsy, in the absence of toxicity, when administered in millimolar concentrations. It has been hypothesized that the high-fat low-carbohydrate ketogenic diet used clinically to control drug-resistant epilepsy in children works by elevating acetone in the brain. Because of their higher energy requirements, children have higher acetone production than most adults – and the younger the child, the higher the expected production. This indicates that children are not uniquely susceptible to acetone exposure. External exposures are small compared to the exposures associated with the ketogenic diet. Acetone is believed to exhibit only slight toxicity in normal use, and there is no strong evidence of chronic health effects if basic precautions are followed. Acetone is an irritant causing mild skin irritation and moderate to severe eye irritation. At high vapor concentrations, it may depress the central nervous system like many other solvents. In one documented case, ingestion of a substantial amount of acetone led to systemic toxicity, although the patient eventually fully recovered. Some sources estimate LD50 for human ingestion at 0.621 g/kg; Acute toxicity for mice by ingestation (LD50) is 3 g/kg and by inhalation LC50) is 44 g/m3 over 4 hours. EPA EPCRA Delisting (1995). EPA removed acetone from the list of "toxic chemicals" maintained under Section 313 of the Emergency Planning and Community Right to Know Act (EPCRA). In making that decision, EPA conducted an extensive review of the available toxicity data on acetone and found that acetone "exhibits acute toxicity only at levels that greatly exceed releases and resultant exposures", and further that acetone "exhibits low toxicity in chronic studies". Genotoxicity. Acetone has been tested in more than two dozen in vitro and in vivo assays. These studies indicate that acetone is not genotoxic. Carcinogenicity. EPA in 1995 concluded, "There is currently no evidence to suggest a concern for carcinogenicity". (EPCRA Review, described in Section 3.3). NTP scientists have recommended against chronic toxicity/carcinogenicity testing of acetone because "the prechronic studies only demonstrated a very mild toxic response at very high doses in rodents". Neurotoxicity and Developmental Neurotoxicity. The neurotoxic potential of both acetone and isopropanol, the metabolic precursor of acetone, have been extensively studied. These studies demonstrate that although exposure to high doses of acetone may cause transient central nervous system effects, acetone is not a neurotoxicant. A guideline developmental neurotoxicity study has been conducted with isopropanol, and no developmental neurotoxic effects were identified, even at the highest dose tested. (SIAR, pp. 1, 25, 31). Environmental. When the EPA exempted acetone from regulation as a volatile organic compound (VOC) in 1995, EPA stated that this exemption would "contribute to the achievement of several important environmental goals and would support EPA's pollution prevention efforts". 60 Fed. Reg. 31,634 (June 16, 1995). 60 Fed. Reg. 31,634 (June 16, 1995). EPA noted that acetone could be used as a substitute for several compounds that are listed as hazardous air pollutants (HAP) under section 112 of the Clean Air Act. Although acetone occurs naturally in the environment in plants, trees, volcanic gases, forest fires, and as a product of the breakdown of body fat, the majority of the acetone released into the environment is of industrial origin. Acetone evaporates rapidly, even from water and soil. Once in the atmosphere, it has a 22-day half-life and is degraded by UV light via photolysis (primarily into methane and ethane.) Consumption by microorganisms contributes to the dissipation of acetone in soil, animals, or waterways. The LD50 of acetone for fish is 8.3 g/L of water (or about 1%) over 96 hours, and its environmental half-life in water is about 1 to 10 days. Acetone may pose a significant risk of oxygen depletion in aquatic systems due to the microbial consumption. On 30 July 2015, scientists reported that upon the first touchdown of the Philae lander on comet 67P's surface, measurements by the COSAC and Ptolemy instruments revealed sixteen organic compounds, four of which were seen for the first time on a comet, including acetamide, acetone, methyl isocyanate, and propionaldehyde. ^ Klamt, Andreas (2005). COSMO-RS: From Quantum Chemistry to Fluid Phase Thermodynamics and Drug Design. Elsevier. pp. 92–94. ISBN 978-0-444-51994-8. ^ Ash, Michael; Ash, Irene (2004). Handbook of preservatives. Synapse Information Resources, Inc. p. 369. ISBN 1-890595-66-7. ^ Myers, Richard L. (2007). The 100 Most Important Chemical Compounds: A Reference Guide. Greenwood. pp. 4–6. ISBN 978-0-313-08057-9. ^ a b c d NIOSH Pocket Guide to Chemical Hazards. "#0004". National Institute for Occupational Safety and Health (NIOSH). ^ Nomenclature of Organic Chemistry : IUPAC Recommendations and Preferred Names 2013 (Blue Book). Cambridge: The Royal Society of Chemistry. 2014. p. 723. doi:10.1039/9781849733069-FP001. ISBN 978-0-85404-182-4. ^ a b Properties of substance: acetone. chemister.ru. ^ "acetone". ChemSrc. Retrieved 2018-04-13. ^ Chiang, Yvonne; Kresge, A. Jerry; Tang, Yui S.; Wirz, Jakob (1984). "The pKa and keto-enol equilibrium constant of acetone in aqueous solution". Journal of the American Chemical Society. 106 (2): 460–462. doi:10.1021/ja00314a055. ^ Bordwell, Frederick G. (1988). "Equilibrium acidities in dimethyl sulfoxide solution". Accounts of Chemical Research. 21 (12): 456–463. doi:10.1021/ar00156a004. ^ a b Lide, David R. (ed) (2003). CRC Handbook of Chemistry and Physics, 84th Edition. CRC Press. Boca Raton, Florida; Section 3, Physical Constants of Organic Compounds. ^ "Working with modern hydrocarbon and oxygenated solvents: a guide to flammability". American Chemistry Council Solvents Industry Group. January 2008. p. 7. Archived from the original on 2009-06-01. ^ a b c "Acetone". Immediately Dangerous to Life and Health Concentrations (IDLH). National Institute for Occupational Safety and Health (NIOSH). ^ Allen, P.W. ; Bowen, H.J.M. ; Sutton, L.E. ; Bastiansen, O. (1952). "The molecular structure of acetone". Transactions of the Faraday Society. 48: 991. doi:10.1039/TF9524800991. ^ a b c d e f Stylianos Sifniades, Alan B. Levy, "Acetone" in Ullmann's Encyclopedia of Industrial Chemistry, Wiley-VCH, Weinheim, 2005. ^ "Update: U.S. EPA Exempt Volatile Organic Compounds". American Coatings Association. 2018-01-30. Retrieved 2019-03-20. ^ Gorman, Mel & Doering, Charles (1959). "History of the structure of acetone". Chymia. 5: 202–208. JSTOR 27757186. ^ Dumas, J. (1832) "Sur l'esprit pyro-acétique" (On pyro-acetic spirit), Annales de Chimie et de Physique, 2nd series, 49 : 208–210. ^ Liebig, Justus (1832) "Sur les combinaisons produites par l'action du gas oléfiant et l'esprit acétique" (On compounds produced by the action of ethylene and acetic spirit), Annales de Chimie et de Physique, 2nd series, 49 : 146–204 (especially 193–204). ^ Bussy, Antoine (1833) "De quelques Produits nouveaux obtenus par l’action des Alcalis sur les Corps gras à une haute température" (On some new products obtained by the action of alkalies on fatty substances at a high temperature), Annales de Chimie et de Physique, 2nd series, 53 : 398–412; see footnote on pp. 408–409. ^ Williamson, A. W. (1852) "On Etherification," Journal of the Chemical Society, 4 : 229–239; (especially pp. 237–239). ^ Gerhardt, Charles (1853) "Researches sur les acids organiques anhydres" (Research on anhydrous organic acids), Annales de Chimie et de Physique, 3rd series, 37 : 285–342; see p. 339. ^ Kekulé, Auguste (1865) "Sur la constitution des substances aromatiques," Bulletin de la Société chimique de Paris, 1 : 98–110; (especially p. 110). ^ Kekulé, Auguste (1866) "Untersuchungen über aromatischen Verbindungen" (Investigations into aromatic compounds), Annalen der Chemie und Pharmacie, 137 : 129–196; (especially pp. 143–144). ^ Loschmidt, J. (1861) Chemische Studien Vienna, Austria-Hungary: Carl Gerold's Sohn. ^ Vujasinovic, M; Kocar, M; Kramer, K; Bunc, M; Brvar, M (2007). "Poisoning with 1-propanol and 2-propanol". Human & Experimental Toxicology. 26 (12): 975. doi:10.1177/0960327107087794. ^ Glew, Robert H (2010). "You Can Get There From Here: Acetone, Anionic Ketones and Even-Carbon Fatty Acids can Provide Substrates for Gluconeogenesis". Nig. J. Physiol. Sci. 25: 2–4. ^ Miller, DN; Bazzano, G (1965). "Propanediol metabolism and its relation to lactic acid metabolism". Ann NY Acad Sci. 119 (3): 957–973. Bibcode:1965NYASA.119..957M. doi:10.1111/j.1749-6632.1965.tb47455.x. PMID 4285478. ^ Ruddick, JA (1972). "Toxicology, metabolism, and biochemistry of 1,2-propanediol". Toxicol Appl Pharmacol. 21: 102–111. doi:10.1016/0041-008X(72)90032-4. ^ "Acetone Uses and Market Data". ICIS.com. October 2010. Retrieved 2011-03-21. ^ Acetone (US Gulf) Price Report – Chemical pricing information. ICIS Pricing. Retrieved on 2012-11-26. ^ Wittcoff, M.M. ; Green, H.A. (2003). Organic chemistry principles and industrial practice (1. ed., 1. reprint. ed.). Weinheim: Wiley-VCH. p. 4. ISBN 3-527-30289-1. ^ Weiner, Myra L.; Lois A. Kotkoskie (1999). Excipient Toxicity and Safety. p. 32. ISBN 978-0-8247-8210-8. ^ Mine Safety and Health Administration (MSHA) – Safety Hazard Information – Special Hazards of Acetylene. Msha.gov. Retrieved on 2012-11-26. ^ History – Acetylene dissolved in acetone. Aga.com. Retrieved on 2012-11-26. ^ What is an Azeotrope?. Solvent—recycling.com. Retrieved on 2012-11-26. ^ Lozano, A.; Yip, B.; Hanson, R.K. (1992). "Acetone: a tracer for concentration measurements in gaseous flows by planar laser-induced fluorescence". Exp. Fluids. 13 (6): 369–376. Bibcode:1992ExFl...13..369L. doi:10.1007/BF00223244. ^ Simpson, Deborah M.; Beynon, Robert J. (2009). "Acetone precipitation of proteins and the modification of peptides". Journal of Proteome Research. 9 (1): 444–450. doi:10.1021/pr900806x. ISSN 1535-3907. ^ "Cleaning Glassware" (PDF). Wesleyan University. September 2009. Retrieved July 7, 2016. ^ a b Acetone MSDS. Hazard.com (1998-04-21). Retrieved on 2012-11-26. ^ a b "SIDS Initial Assessment Report: Acetone" (PDF). Environmental Protection Agency. ^ a b Likhodii SS; Serbanescu I; Cortez MA; Murphy P; Snead OC; Burnham WM (2003). "Anticonvulsant properties of acetone, a brain ketone elevated by the ketogenic diet". Ann Neurol. 54 (2): 219–226. doi:10.1002/ana.10634. PMID 12891674. ^ American Chemistry Council Acetone Panel (September 10, 2003). "Acetone (CAS No. 67-64-1) VCCEP Submission" (PDF). pp. 6, 9. Retrieved 2018-04-14. ^ Basic Information on Acetone. Ccohs.ca (1999-02-19). Retrieved on 2012-11-26. ^ "What are the potential health effects of acetone?". Canadian Centre for Occupational Health and Safety. Archived from the original on 2008-10-17. Retrieved 2008-10-21. ^ Darwent, B. deB. ; Allard, M. J.; Hartman, M. F.; Lange, L. J. (1960). "The Photolysis of Acetone". Journal of Physical Chemistry. 64 (12): 1847–1850. doi:10.1021/j100841a010. ^ "Safety Data Sheet Acetone" (PDF). J.M. Loveridge. Archived from the original (PDF) on 2009-03-20. Retrieved 2012-11-26. Wikimedia Commons has media related to Acetone.